Ballinamore Community School Principal Mr Leyden photographed with Leaving Cert student last year, James Lennon, after receiving his Excellence Scholarship in NUIG where James is studying medicine. We entered two teams into the First Year Football Brady Cup competition. We had tough competition with ten teams participating in total. We managed to secure two semi final places losing out to Carrick and Mohill in those games. Well done to the lads on a great performance on and off the pitch. It has been a busy start to the school year and all our Ladies teams have started their respective competitions. Senior Girls have played two matches. They were unlucky to lose their first match away to St Nathy's, Ballaghaderreen by 3 points. They played much better in the next fixture and won their second match against St Claire's, Manorhamilton in St Felim's. The last group game is against Coola CS away and the girls need to win this to have a chance to qualify. The girls have won both their group games against St Mary's, Ballina and Carrick CS. They have already qualified for the semi final and their last game against St Claire's, Manorhamilton will decide who tops the group. Well done on two great performances! We have played one match so far and lost to Lough Allen College, Drumkeeran away on a score line of 9:2 to 3:7. Our next game is against Mohill CS in St Felim's on Friday 19th. We have at least two more group games left to play. Thanks to all the girls for coming out and giving up your time to represent your school. Best of luck for the rest of the year. 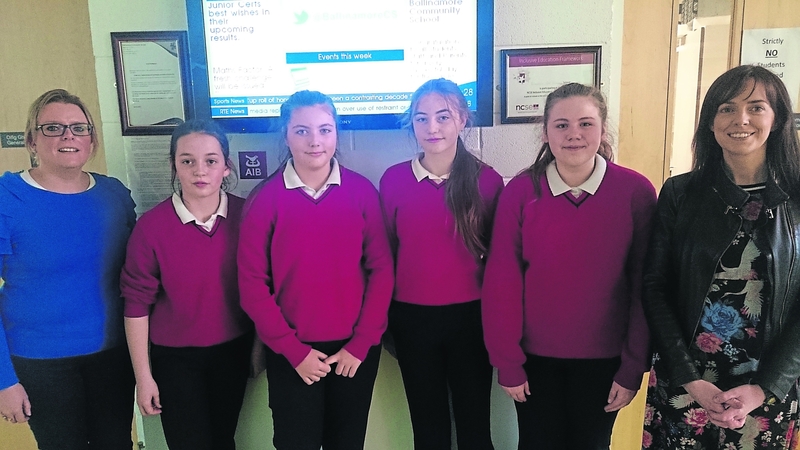 As part of Maths week students were involved in puzzle activities throughout the week and a Maths quiz was held for all first year pupils. 4 of the winners received a prize for their excellent result!